How are you today? I know I will be much better today than Monday. I now understand why Garfield hates Monday’s! It was just one of those days. I’m just glad it’s over, no use in crying over spilled milk. So off to new and better things. Speaking of better things I have an easy, wholesome recipe for you. This is one of those wing it recipes that came together beautifully. 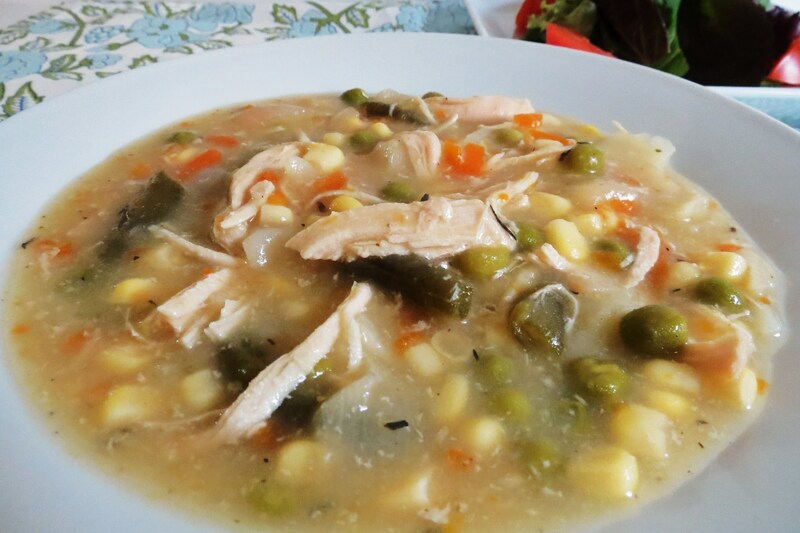 I was in a rush, so I threw together a bunch of ingredients and made this most awesome soup! This is my Chicken Pot Pie Soup and boy did it taste just like a chicken pot pie without the crust. My Husband loves Chicken Pot Pies, I always buy him the one’s from Swanson, you know the ones that are like a bazillion calories and loaded with sodium. Yuck! He loves them and hey there .72 at Target and easy to make. Who am I to argue with what he eats? After he raves, about his pot pie, he ask’s why don’t you make pot pies? I thought, hmmm, could I? Could I make it lower in calories and sodium? 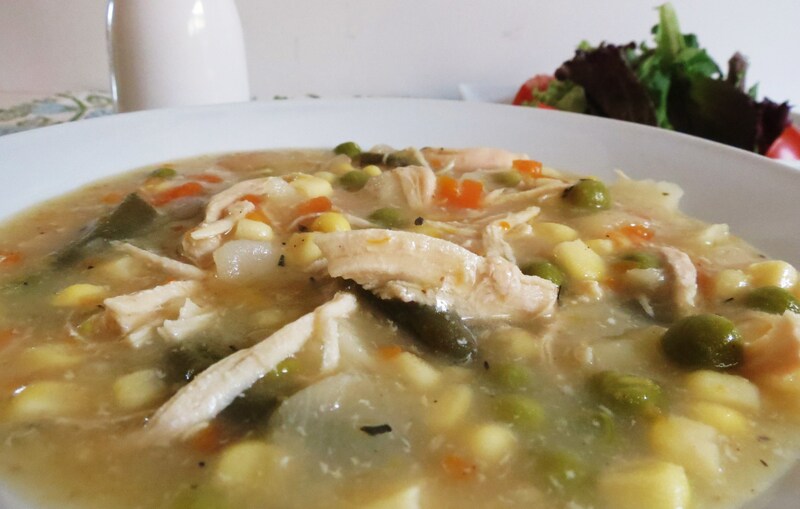 I took on the challenge and came up with this thick wonderful soup. I’ll be honest with you, I did try to make a crust out of Phyllo Dough but it didn’t work out. I don’t like working with the pastry because it always falls apart on me. I had the idea, that when the soup was done, I’d place a few sheets of Phyllo Dough on top and bake it for 7 to 10 minutes. I gave up on trying to work with the dough so I scraped the idea. Besides I didn’t need the extra calories and we didn’t miss the crust with this soup. 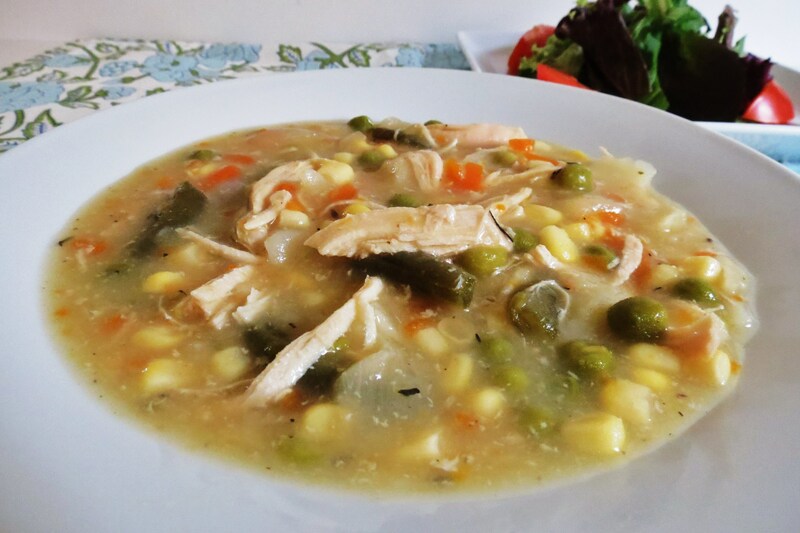 I made this soup using frozen chicken breasts, a 10 oz. bag of Trader Joe’s Organic Foursome which is peas, carrots, corn and beans, diced potato and some seasoning. To thicken it up I used cornstarch and water. I was never good at making gravies with cornstarch so I was weary that I would ruin the soup, but I didn’t and it was the perfect thickness. I’m patting myself on the back with that one! 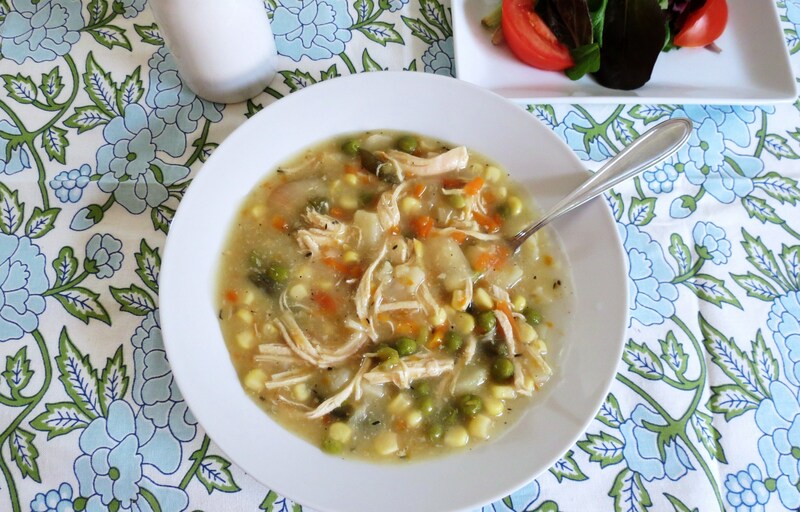 We had this soup as leftovers the next day and I must admit, it may have tasted even better! This was one big pot of soup that did not go to waste. I was so happy that the family loved it and it was healthy for them. I thought forsure that Little Jenny wouldn’t have liked it because there were vegetables in it, but she at ever last drop! So this soup must be good if she ate all!!! In a crockpot place the chicken in first that add the remaining ingredients. Stir to combine. Cook on high for 5 hours, or on low for 7-9 hours. Just before serving the soup, in a small bowl add cornstarch and water, mix until the cornstarch is dissolved. Add the cornstarch mixture to the soup and constantly whisk together until the soup has thicken. Just a few minutes. It’s dinner time and I honestly don’t know why I write my blog before I make dinner. Every time I post something before I eat, I get extra hungry! Therefore I make way to much dinner. It’s Monday night so it’s fend for yourself night, so I’m thinking of making a tuna melt. Remember the one I made a couple of weeks ago? I can’t get it off my mind and yesterday I made the whole wheat bread so I am just itching for a sandwich. Yum, yum, yum! But before I go, you know I’m gong to ask you, to vote for Peanut Butter and Peppers. I was nominated most healthy eating blog from Fitness Magazine and I would just love your vote. Currently my standings are at 50, which isn’t bad considering I have only been blogging for 6 months. One of the best things I ever decided to do! I just get so excited over my blog. it’s so rewarding and well worth the extra work. Anyway, if you like PBandP, please vote for my blog. Just go here. Have a great day! Hope the sun is shining where you are!! What a great idea! Love the idea of no crust! Now this is what I call a scrumptious savory meal! It looks like it is just bursting with flavor–a must try recipe! Jennifer that looks SO tasty and your photos really jump out…I want to poke my hand through the screen and grab the spoon! I grew up on those Swanson chicken pot pies. 🙂 I still love pot pies to this day. I’ve never made one because my husband doesn’t like them. 🙁 I will have to make this soup! Maybe it will change his mind! I grew up on them too! They seemed like they got smaller or maybe I’m just getting bigger? Oh my goodness…this just looks like comfort in a bowl! Sounds amazing! Everything about this soup makes me happy! 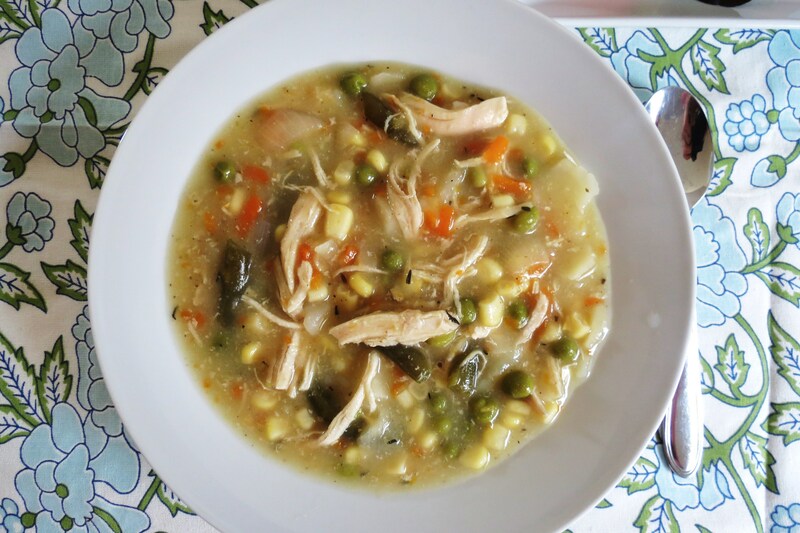 I LOVE chicken pot pie, and I LOVE soup – definitely trying this!! Your pictures are looking great too! This looks SO good. I’m making it just as soon as the weather dips back into the 40s (next week). Thanks for this post! Um, YUM! Can’t wait to try this!! I found this post because E actually linked to it for Lots of Link Love over at my blog, Stress Case. You can come read about Lots of Link Love and what it’s all about if you’d like! Thank Amee! I’ll be there this weekend! Thank you for the invite!! I made this, but I’m not planning to eat it until tomorrow. Meanwhile, was gonna stick it in my fridge. Should I add the cornstarch now, or later? Also, love your blog so much! Good morning Valerie, I think you could add the cornstarch anytime as long as the soup is hot. I added mine in when I made it, and after dinenr I stored the left overs in the fridge and it tasted just as good, so I think either option would be ok. Hope you enjoy it!! Hey, do you pre boil the chicken, or do you cook it with the soup?? Looks delicious. Did you chop the chicken before cooking in the crock pot or leave it whole and chop it right before eating? The soup looks delicious. Did you add spinach at the end? I was wondering what the green leaf in the soup was? Hi Joan, There is no spinach in the soup. The green is beans. But adding spinach would be a great idea. I’d throw it in at the end, cover the crockport and once wilted serve. So quick and so very very easy to make the night before. My husband loved it so much that he refused to let me give any of it away when friends came over later that evening. Yah! I am so glad you liked it! It’s one of my Husbands favorites too! The leftovers taste even better the next day! You made my day! Thank you for letting me know! 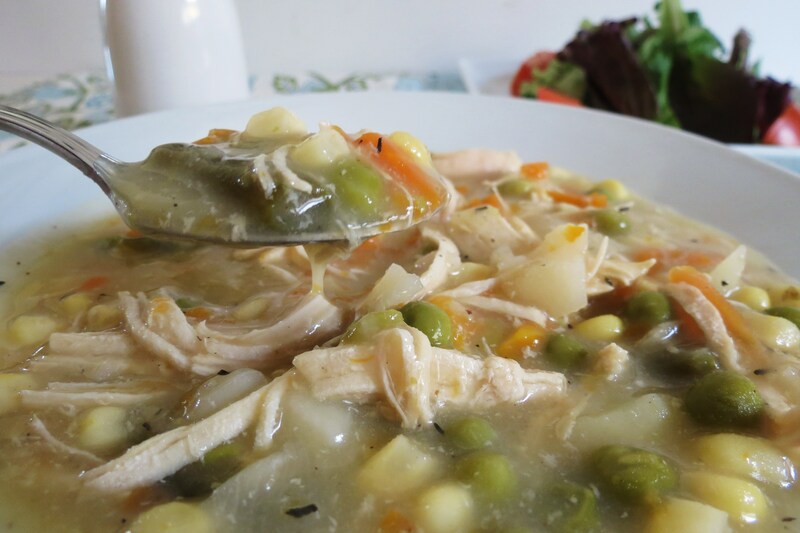 We have been making Chicken Pot Pie Soup for a while now. Ours comes together quickly and easily. Instead of using a bunch of different veggies, just use a can of Veg All, or store brand equivalent. I made this and it came out amazing, thank you so much for this recipe, this is for sure something I will be making again soon, my husband also loved it how ever our 2.5 yr old son would not try it although he’s fussy with everything 🙂 we used all organic ingredients also.